Leader of the Indigenous People of Biafra (IPOB), Mazi Nnamdi Kanu has said he will remain eternally grateful to his sureties for standing by him all through his travails, trials and tribulations. He described the bench warrant against him by Justice Binta Nyako as “mere academic exercise,” expressing confidence that it would be ignored by the international and diplomatic community. In a broadcast monitored by The Nation corespondent in Awka, the IPOB leader insisted that Nigerian government could not by its antics incite the world against him. He added that the diplomatic community had since expressed its disapproval of what had befallen IPOB in Nigeria. He said, “I remain eternally grateful to my sureties for standing by me all through my travails, trials and tribulations. “Where a case is for hearing of motion, the trial judge must hear the motion and adjourn for any other process. On no account should he hear a motion and hear the merits of the matter, not to talk about delivering judgment. He may consider doing that in the very rare circumstance of consent by parties. 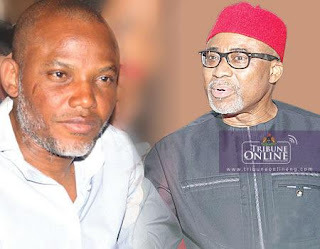 According to Kanu, another disturbing trend was the use of the media to prejudice public opinion against IPOB before and during trial, alleging that examples abound where media houses allowed themselves to be used as “willing agents” of persecution. “In March last year, a continental human rights court restrained the Nigerian government from persecution of members of IPOB which the government is yet to obey. “The arrest, detention and murder of IPOB family members is illegal, unconstitutional and in breach of the written laws of Nigeria. “The fact that judges and supposed legal practitioners allow this travesty to continue is indicative of the level of ignorance that pervades the Nigerian judiciary,” he said.